Analysis: The 49ers placed their franchise tag on kicker Robbie Gould, who thus far has opted not to sign the $4.971 million tender. Meanwhile, Gostkowski presumably prefers to stay in New England but hasn't received a contract offer to his liking. The 49ers can rescind Gould's tender and allow him to become an unrestricted free agent if they decide to sign Gostkowski. Both kickers offer impressive accuracy with middling leg strength. Analysis: Despite finishing in the top 10 in points scored 11 times in his 13 seasons, Gostkowski wasn't extended the franchise tag by the deadline like he was in 2015. 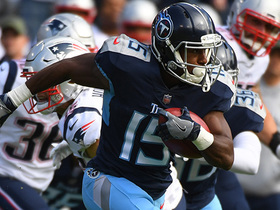 The Patriots' decision left him free to explore all options once the new league year started March 13, but it appears as if he'll stick with the only organization he's ever known. Gostkowski is not receiving a franchise tag from the Patriots, Adam Schefter of ESPN reports. Analysis: There's still a chance Gostkowski re-signs with New England, but he'll at least have an opportunity to assess other offers. Regardless of whether it's Gostkowski or another player, the Patriots' kicker will be a sensible choice at the end of fantasy drafts until Tom Brady retires. Gostkowski made two of his three field-goal attempts in Sunday's 13-3 win over the Rams in Super Bowl LIII. 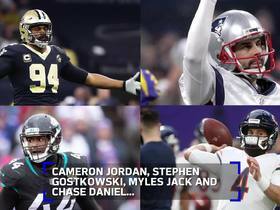 Analysis: Gostkowski, who added an extra point in the contest, finished the regular season ranked fifth overall among NFL kickers in scoring with 130 points. The 35-year-old is eligible to become a free agent this offseason, but we suspect the Patriots would like to retain the 2006 fourth-rounder, either via a contract extension or through the application of the team's franchise tag. Gostkowski made his only field-goal attempt (from 47 yards) and was 4-for-4 on extra points in Sunday's AFC Championship Game. 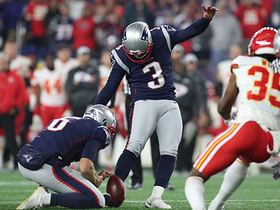 Analysis: Gostkowski ranked fifth in scoring among kickers in 2018 and was consistent as ever Sunday. Through two playoff games, he's converted all three of his field-goal attempts and all nine of his extra points. Gostkowski, who made 27 of 32 field goal attempts this past season, ended up recording 130 points in 2018. Analysis: That's a 26-point drop-off from 2017, but Gostkowski still carved out fantasy utility while kicking behind the New England offense, ranking fifth overall among NFL kickers in scoring. 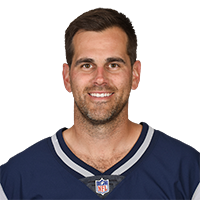 Gostkowski is eligible to become a free agent this offseason, but we suspect the Patriots would like to retain the 34-year-old, either through a contract extension or via the application of their franchise tag. Gostkowski made his only field-goal attempt (from 24 yards) in Sunday's 24-12 win over the Bills, en route to recording six points. Analysis: Gostkowski heads into Week 17 with 122 points, a mark that places him seventh in the league. He's been a solid fantasy kicker this season, but the 34-year-old has slipped some on that front, after having logged 156 points (good for second in the NFL) last season. Gostkowski made his only field-goal attempt in Sunday's 17-10 loss to the Steelers, en route to logging four points. Analysis: The four points tie Gostkowski's season-low output from Weeks 3 and 10, but he's generally a pretty steady fantasy option while kicking behind the New England offense. 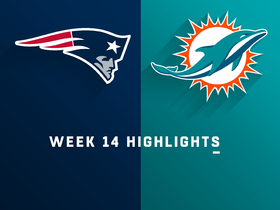 Gostkowski missed an extra point as well as a 42-yard field goal attempt in Sunday's 34-33 loss to the Dolphins. Analysis: Gostkowski did make two of his field-goal tries in Week 14, but the missed extra point -- his first of the season -- was particularly costly in the team's one-point loss. He heads into Week 15 action with 112 points, which currently ranks fifth in the NFL. Gostkowski made one of his two field-goal attempts en route to logging six points in Sunday's 24-10 win over the Vikings. Analysis: Gostkowski has only notched double-digit points twice this season, but he remains a solid fantasy kicking option while working behind the New England offense. Gostkowski made both of his field-goal attempts en route to logging nine points in Sunday's 27-13 win over the Jets. Analysis: With the Patriots' bye week in the books, Gostkowski profiles as a strong fantasy kicking option for the rest of the season while working behind the New England offense. 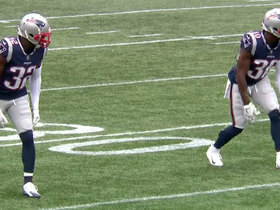 Gostkowski made one of his two field-goal attempts en route to logging four points in Sunday's 34-10 loss to the Titans. Analysis: Gostkowski's made attempt was from 52 yards, but his overall fantasy impact was hindered by the fact that the Patriots offense was held in check by the Titans. Those who normally rely on Gostkowski will need to seek a temporary replacement for him in Week 11, with the Patriots on bye. He'll return to action Nov. 25, when the team takes on the Jets in a favorable matchup that could revive Gostkowski's productivity in Week 12. Gostkowski converted his only field-goal attempt (from 28 yards) en route to logging seven points in Sunday's 31-17 win over the Packers. Analysis: Gostkowski is on pace to score 149 points this season, a mark that makes him a solid fantasy option while kicking behind the Patriots offense. He'll take aim at the Titans this coming Sunday before his team heads into a bye in Week 11. New England Patriots kicker Stephen Gostkowski nails 28-yard game winning field goal. 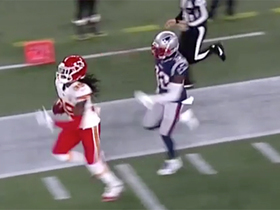 Kansas City Chiefs Rookie Tremon Smith races down sideline for 97-yard kick return. 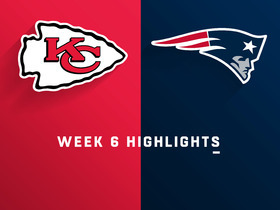 Watch the highlights from the Week 6 matchup between the Kansas City Chiefs and the New England Patriots. High school football kicker Anna Zerilli got a surprise visitor at Gillette Stadium, and it was none other than New England Patriots kicker Stephen Gostkowski. New England Patriots kicker Stephen Gostkowski makes 46-yard field goal. New England Patriots kicker Stephen Gostowski misses extra point.